New Angeles is a semi-co-op board game set in the Android Universe designed by James Kniffen and published by Fantasy Flight Games. New Angeles has one of my favorite game mechanics, the secret traitor, so I was already excited to play. I also love the fact that the game is a semi-co-op which allows for multiple winners. This does a really great job of making players engage with each other and negotiate constantly. And I appreciate that the game has made an effort to be diverse and to equally represent men and women. In New Angeles, everyone is playing as a different megacorporation. The goal of the game is to keep the city from falling into chaos while also raking in more capital than your rival corporation. This rival mechanic means that there can be multiple winners. For instance, if the Jinteki corp has more capital than their rival, the Weyland Consortium, they win. But if the Weyland Consortium has more capital than their rival, NBN, then they also win! This really encourages the players to strike up deals with each other, in the pursuit of keeping the city happy and running, while also trying to further their ultimate goal of gaining capital. Of course if you draw the traitor identity, the Federalist, the goal of the game is very different for you. You are working to get at least 25 capital, before causing the city to fall into chaos. If the Federalist manages to win, none of the other players win. The game is all about negotiating. You’ll be playing over a number of rounds to try to meet the required demand of goods and services (consumables, entertainment, etc) that the city needs to stay happy. 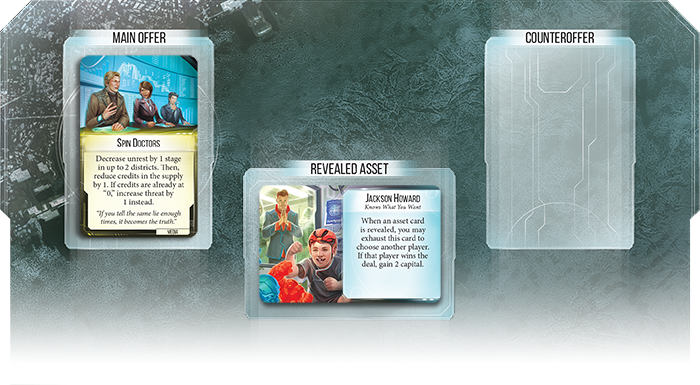 At the beginning of each turn, an asset card will be revealed. Players will use their action cards to bid on the asset card, which will give the winner of the bid a permanent bonus throughout the game. Your action cards will let you do things like move a token to make a certain section of the city produce, clean up crime that is negatively affecting production, or fix an outage which stops a section of the city from producing. The current player will put the first action card down in the main offer location. The next player now has the option to put an action card down in the counteroffer location. If the next player also wants to challenge the primary bid, they must discard a card in to put a different action card down to bid. It goes around like that until everyone has either put in a bid or abstained. Then the players that do not have an offer down will vote on which person wins the asset card, and therefore gets to execute their action. 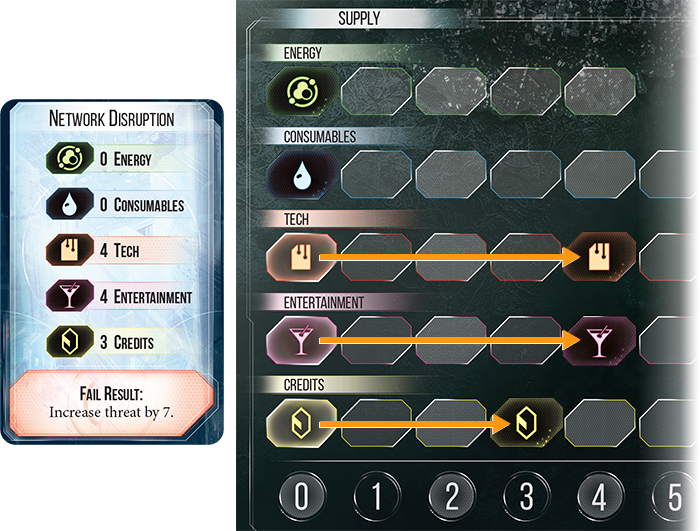 Those action cards are the only way to affect the city and help meet the production demands. So there is a ton of negotiating that happens in each bidding phase. Each player must weigh their own personal gain versus what is needed to keep the city afloat. Also, the players who have bids in can make deals with the other players. I love how much player interaction New Angeles has. One of my absolute pet peeves is a game where I have a ton of time between my turns where I am doing absolutely nothing. This game has none of that. You are always involved at every moment of the game, brainstorming how to make the city produce what you need to meet demand, trying to earn yourself credits and keep ahead of your rival, and attempting to acquire those juicy asset cards to give yourself cool bonuses. New Angeles has three different demand phases, where you have to check to see if you have met the specific demands of the city. Not meeting the demand is one of the main ways you will accrue threat in this game, and it’s the main way for the Federalist to win. Other actions will cause you to gain threat, which if you hit 25 on the threat track, everyone who is not the Federalist immediately loses. You’ll definitely want to carefully manage the small accumulation of threat throughout the game, because if you are too careless and let it build up too much, the Federalist can easily swoop in and win the game. There’s even more complexity to the game’s rules, which I won’t go into here. But if you’re interested, you can check out our Rules Explanation Video, which will give you all the tools you need to hit the table and start playing. I heartily enjoy this game. It’s got some creative mechanics, great player interaction, and a fantastic traitor mechanic. The rules are a bit complicated, so I wouldn’t recommend it for people who are just starting out in the hobby. It is also a bit of a longer game, especially if there’s a ton of arguing and negotiation. So you’ll definitely need to set aside a good block of time to play this game. Don’t get me wrong though, it’s definitely worth taking the time out of your day to play this one. Thanks to the fact that everyone is always involved at every moment in New Angeles, it never feels like the game is taking too long to play. I also appreciate that New Angeles has good diversity and representation. 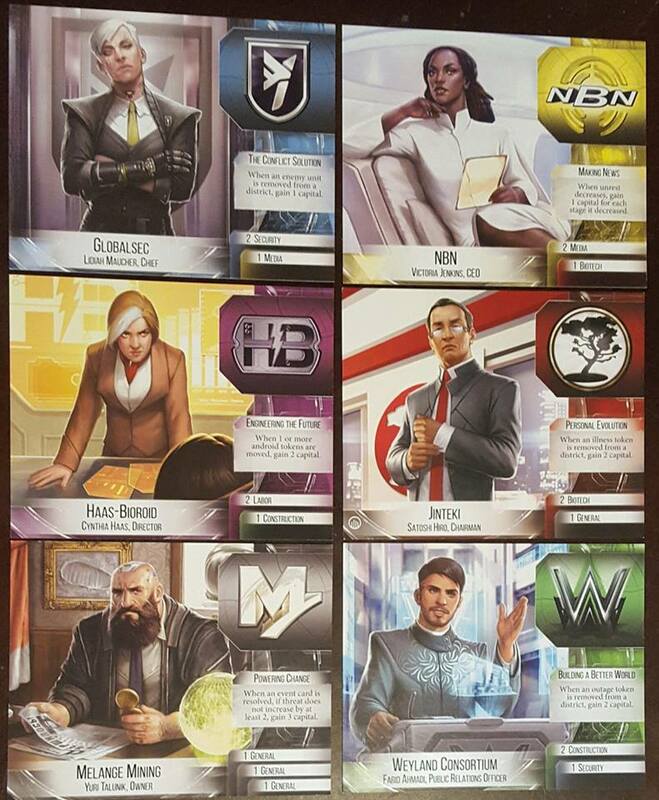 Each of the megacorps are represented by a player card which pictures the person at the head of the organization. There are an equal number of women and men, and half of them are people of color. I love that all of the women and people of color are portrayed respectfully (no skimpy clothes on the women and no stereotyping of different cultures). Every single character looks freakin’ badass. They’d have to be pretty ruthless to get to the top of a megacorp, and they look it. As a female gamer, great representation and diversity is so important to me. I love being able to see myself in the games I play, so I get excited when there are women playable characters. I want the board gaming culture to continue to take strides towards being an inclusive community. When people of color and women are portrayed in the games themselves, it subtly reinforces the idea that we belong. It normalizes our existence and welcomes us into the hobby. New Angeles is for 4-6 players, takes about 2-4 hours to play, and retails for $59.95.